We’ve all seen those cool swashbuckling moves in the movies: Zorro, Vikings, Knights, James Bond, etc. 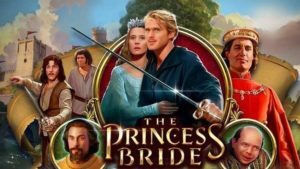 great sword fighting scenes and of course . . . light sabers from the Star Wars series. You might have wondered if it’s too late to give it a try. The answer is no, it’s not too late in fact . 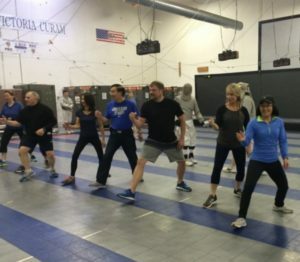 . . picking up sword as an adult is one of the best times to start fencing! 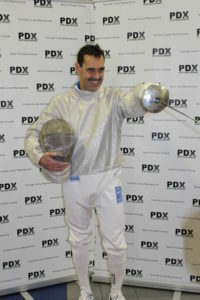 Many people start fencing after college, mid to late 20’s, 30’s, 40’s, 50’s and through every age group to 90. As an adult you’ll learn quicker and progress faster than most children. Your life experience is an advantage. Many people return to fencing after college, while establishing careers, during or after raising a family. 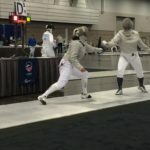 Many parents started fencing as a way to connect to their child or each other. It doesn’t matter the timing when you start, fencing will get your mind and body moving in a fun and exciting way. 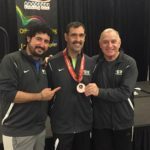 Rick Herrera started fencing to have fun with his two sons, they are both in college and he is competing and winning natiionally. STRESS RELIEF is one of the phrases we hear frequently from adults who fence. You arrive at the club after an exhausting or stressful day. By the time you leave, you are drenched in sweat, mind clear, stress of the day gone. You’ve become completely immersed in the moment, mind focused – It’s just not possible to think about other things when someone has a sword in your face and is challenging you! You’ve had a great work-out, challenged yourself and didn’t even realize it. FUN WORK-OUT. You’ll find yourself looking forward to coming in to fence and won’t think of it as a work out. Fencing is mentally fun and challenging and you don’t realize the incredible work out you get as the time flies by. You’ll be getting and staying in shape without having to get on a treadmill. 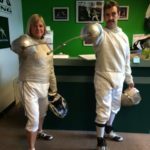 You don’t have to be in great athletic shape to start, just have the desire to learn something new and you will progress in fitness and fencing at your own pace. 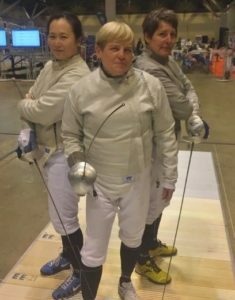 Cheryl Maslen picked up a sword at age 57, she has lost 60 pounds and kept it off, on her way to fencing success. She is in the club frequently and a wonderful part of our community. Read Cheryl Maslen’s inspiring story here. LIFE-LONG sport. Yes, fencing is a life-long sport. There are people in their 80’s and 90’s fencing competitively. 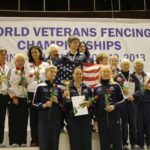 Fencing keeps your mind alert, active and making critical thinking decisions. Staying healthy is much easier with a sport you look forward to practicing – it’s not a workout its a duel! 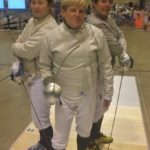 Every person you fence thinks differently, reacts in their own way which keeps the sport very interesting and every duel unique. Will you get bored? No, actually the better you get at fencing the more you want to learn, practice and duel (called bouting) against different people. There are competition categories for many different age groups. INTERESTING PEOPLE. Yes, you will be meeting very interesting people when you start to fence, from many walks of life. You’ll make new friends usually out of your own social circle, and you’ll have an instant connection in common. In our club, our adult community is encouraging, helpful and a lot of fun. From the quiet introvert to the outspoken, it’s quite a mix. 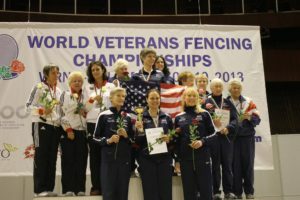 You don’t have to be the physical jock to have equal success in fencing. The thinker who can out strategize has the same odds of success. BRAIN HEALTH. Remember that phrase “use if or lose it?” Learning new skills will keep your brain healthy, active, while the physical activity will help your body, the mental exertion used in fencing will keep your brain challenged and stimulated. Read this excellent article from The Huffington Post “Here’s How Picking up a New Skill Can Help Your Brain”. . Having to out-think your opponent will keep you on your toes! 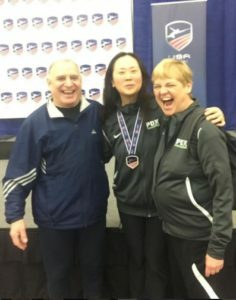 Lynn wins her first North America Cup Medal with teammate Cheryl cheering her on all the way. 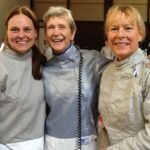 With all of that, the number one reason to start fencing as an adult is very simple, It’s fun! Don’t underestimate the enjoyment factor. “ It’s actually a core need for psychological well-being. Learning can help us build confidence and a sense of self-efficacy. It can also be a way of connecting with others too,’ says Vanessa King, positive psychology expert at Action for Happiness. ‘As human beings, we have a natural desire to learn and progress. Psychologists call it mastery.’ See this article for King’s more in-depth discussion on the health benefits. . . Keeping yourself interested, enjoying what you are doing is the best way to keep yourself mentally satisfied, happy, life in a happy balance and healthy. Everyone around you will benefit from a happy you. You deserve it! Next Next post: How Fencing Can Benefit Your Child – Try it!